One nice thing about wandering around in the wilds of Africa for three weeks with no phone or Internet connection is that it gives the mind time to relax and do some useful processing—especially in the sub-conscious—while lions and hyenas and other animals howl at your tent at night ;~). Something I wasn't expecting to think about popped into my mind during the trip: these mirrorless systems are real "keepers" and most of them can now serve real photographic purposes for a broad group of photographers. We had quite a few mirrorless cameras at my recent Botswana workshop, everything from Nikon 1's to Fujifilm X's to Olympus and Panasonic m4/3's. So one thing I was watching was how well each of them were doing for their users in what was, to say the least, challenging situations. That led to me thinking about how well the others would do, too. The goal of my workshops is to teach students to achieve levels of imagery that they haven't achieved before, and in both challenging places and situations. To be a "keeper" means that these cameras really have to deliver in lots of different areas and not get in the way in any others. The brutal climate (wind, sand, heat, ubiquitous water, tortuous bouncing around) also demands a lot from gear. Everything got torture tested. As I'll eventually get around to in my end-of-workshop report, none of the mirrorless cameras got injured on this trip, but we had a couple of DSLR casualties. So let's see if I can put the current mirrorless world into perspective for you as I see it (remember, I've been using these cameras in field in rough conditions since 2009). Bottom line: Fujifilm, Olympus, Panasonic, and Sony seem to be filling out fairly complete lines that go from lowest consumer to very high level prosumer or pro products. 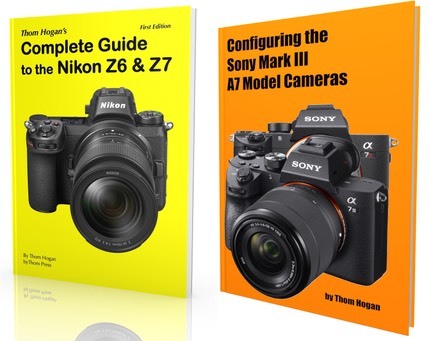 Of those, note that only Sony still has any DSLRs to compete with: for the others, at the moment mirrorless is their sole interchangeable lens camera lineup, which is probably why they've filled out their lineup faster than the others. Nikon and Samsung seem to be targeting only the consumer realms for now. Nikon obviously has DSLRs that live just above the mirrorless realm, and seems cautious at competing with themselves. Leica is as high-end as it's ever been, with no consumer options. No surprise there. Canon and Pentax have only one toe in the water at the moment, which is a bit surprising. Canon and Pentax, like Nikon, don't necessarily want to compete with their profitable DSLR lineups, but mirrorless camera sales are 20% of DSLR sales, so that's a bit like they're trying to ignore 1/6th of the market. I'm going to leave Leica out for the moment in my subjective assessment, as I think most people considering Leica are looking at it for very specific reasons and it really stands alone in what's being offered at the moment (full frame, for one thing). All of these rankings have tightened up considerably in the past year as everyone has been upping their game trying to engineer out any competitive disadvantages. It's only the bottom ranking in each of the above categories where I find anyone considerably behind the others; the top few rankings in each category are arguably quite close. If I were really choosing a mirrorless camera, the first three rankings in each of those categories are close enough now that I'm not sure that any of those rankings would be defining my ultimate choice (indeed, note that I shoot mirrorless mostly with Olympus cameras that are ranked number 2 in two of those categories, so I'm practicing what I'm preaching). That said, if one of those categories (e.g. image quality or focus) is way, way up on your needs list, then pay close attention to the differences. That said, the number of truly compelling cameras in the mirrorless market right now really is fairly broad: Fujifilm X-E1 and X-Pro1, Olympus E-P5, E-M1, and E-M5, Panasonic GX7 and GH3, and the Sony NEX-6 or NEX-7. If you can't find a mirrorless camera to your taste in that group, then what you want probably doesn't exist. Note that all but one of those I just mentioned have a built-in EVF, and the one that doesn't has a very nice optional EVF. All these are very capable cameras that can take superb images in the right hands. They aren't DSLRs, but if you take the time to learn their nuances and master them, they can certainly step into DSLR territory for many shooters. On the other hand, the Canon EOS M, Fujifilm X-A1 or X-M1, Nikon AW1 or V2, Panasonic GF6, Samsung NX300, and the Sony NEX-5T or NEX-F3 all make a darned good substitute for a high-end compact camera, at least if you can pick one up for the right price (e.g. compact price, not the list prices of these cameras). Put another way, there's not really a dud in the bunch. The best may be better than some DSLRs, the worst is still better than virtually all compacts. But here's the but (you knew there was one coming, right? ): most of these cameras are priced higher than low-end DSLRs. That sentence in bold, above, suggests that mirrorless does indeed fit in between compacts and DSLRs in terms of quality and shooting ability, but the price of most of these cameras is clearly in DSLR territory, and not usually low-end DSLR territory. Basically, the value proposition is not quite right with most of the mirrorless cameras. Which is one reason why I've suggested that you buy behind the curve with mirrorless. Last year's model instead of this year's. As much as the E-M1 looks like a real winner, There's a US$450 difference in price between it and last year's E-M5 at the moment. There's certainly not a US$450 difference in image quality. We could argue about some of the new features and how much value they do or don't add, but US$450 is 47% of the E-M5's current price. Bottom line: The cameras have improved, some can be considered DSLR or high-end compact substitutes, but the price is still high on most of these cameras. Buy on sales if you're value sensitive. Yeah, look at the m4/3 column: lots of depth and breadth. Indeed, as I've pointed out before, more choice than Canon EF-S or Nikon DX, which the Canikon product managers ought to be ashamed of. Canon and Pentax lag behind the others (and some of those Pentax lenses are so-called Toy Lenses, with no aperture control and limited image quality). The rest of the parties all seem to be filling out their lineups and at least getting the breadth part right, if not the depth. I've been impressed with the lenses from all of these companies, though some a bit more so than others. Canon's offerings are highly limited in quantity, but the quality is good. Fujifilm has considerably broadened their lens lineup, and all of the XF lenses are excellent. Nikon's offerings are surprisingly good other than the 10mm f/2.8. They need to be with that small sensor. Samsung's lenses have been consistently very good performers. Their 16mm f/2.4 is better than all the other 24mm equivalent options except the Olympus 12mm f/2, yet very compact for an APS lens. Sony started with a lot of what I would call mediocre lenses, but more recently almost everything they've released is more in line with what I expect. Whereas two years ago you couldn't put together a quality NEX lens kit, today you can. I can now say that I've got a NEX lens kit that's extremely good, with a couple of excellent lenses in the mix. But those m4/3 lenses are tough for everyone else to match. With two major manufacturers dovetailing their lens offerings and strong third party support, it's just hard to ignore the m4/3 lenses when considering a possible mirrorless camera. There are very few duds in the line, even in the kit lenses. Olympus has long had a reputation for making superb lenses, and it shows in the m4/3 lenses they've produced. Panasonic seems to be matching them pretty well in that respect. As much as I like pretty much all the Fujifilm cameras and lenses, I keep coming back to my Olympus OM-D cameras and m4/3 lenses as my primary mirrorless system. Depth and breadth of the lens lineup coupled with high quality is a tough thing to beat. That said, we had four different mirrorless systems in use by students and staff at the Botswana workshop, and one thing I noted was that they were all serving their users well. I saw great shots from all the systems during image review. If you're not getting great shots from an X, CX, m4/3, NX, or NEX system, it's not the camera that's the problem. Well, okay, the camera may get in the way a bit: the Olympus menu system is notoriously complex and difficult to come to grips with. But that's a problem you can get around by just devoting some time to study and understand it. These days I'm pretty much one with my E-M5 now that I've configured it the way I want to shoot and know where to go to change a setting. Mirrorless has come a long, long way in its brief history. Where four years ago it was an oddity and there were major shortcomings in performance attributes that you had to overlook, today things are quite different. If you dismissed mirrorless cameras two years ago, you owe it to yourself to take another look.